Join us for a solutions-focused presentation and discussion with energy experts providing federal, state, and local perspectives. 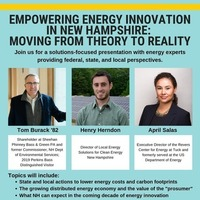 What NH can expect in the coming decade of energy innovation. Refreshments starting at 4:30pm and panel to begin at 5:15pm.